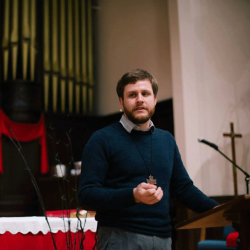 Alex Wilgus is head pastor of Logan Square Anglican Church and Assistant Pastor of Redeemer Anglican Parish. Alex studied philosophy at Wheaton College and graduated in 2009. He holds a Master’s degree in the Teaching of History from the University of Illinois at Chicago. Alex is editor in chief of The Common Vision an online Christian journal of religion and culture. His passion is to bring the gospel to the city of Chicago through the liturgy and ministry of the Church and to help raise a new generation of Christian creatives and thinkers. Alex lives in Logan Square neighborhood of Chicago with his wife Lauren and his young son Owen.